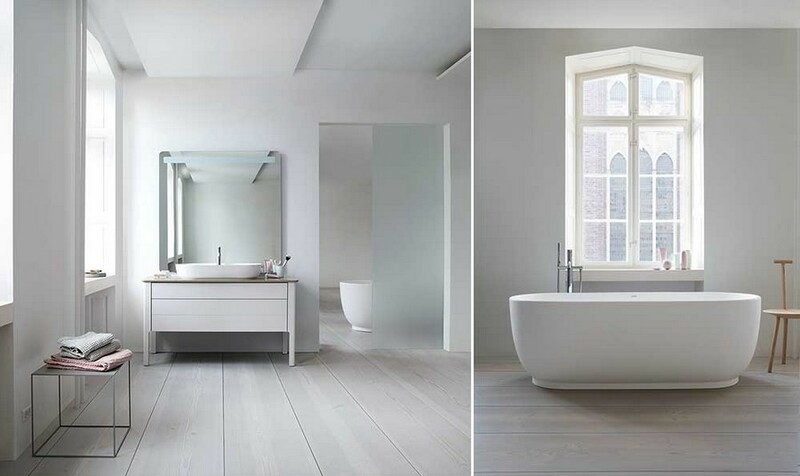 This year the world famous producer of bathroom solutions Duravit celebrates its 200th anniversary. And of course, their stand was one of the most attended during the international bathroom exhibition ISH that is held twice a year in Frankfurt am Main. In conjunction with this event many companies launch new collections and do their best to create most innovative bathroom solutions. And Duravit was not an exception. Let’s see what they have in store for us this year! 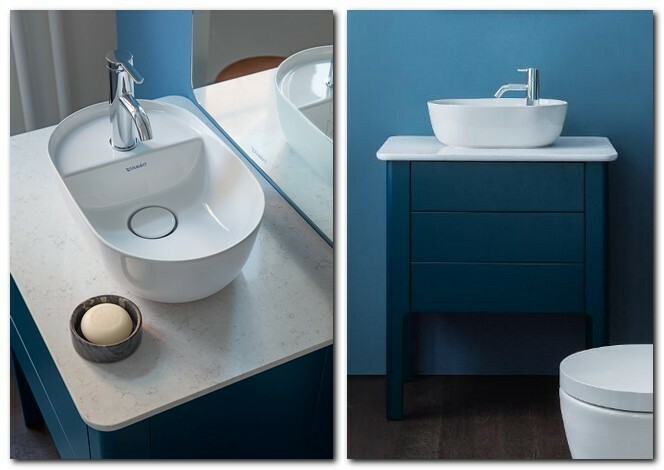 Duravit was among the pioneering companies, which made an attempt to have a brand new look at the image of a bathroom and show that this room deserves a touch of design just like any other room in the house. It has been about 25 years since we first saw sanitary ware that could be named pieces of art and design. And now the company proceed this tradition with their new line dubbed the Luv. Its author is a prominent industrial designer of our time from Denmark – Cecilie Manz. Cecilie’s idea was pretty non-standard – she decided to reconsider the ancient prototype of a washbasin to work out a new piece of contemporary design. Do you know what it was? It was a common basin put on the table! And the new collection appeared to be as laconic and amazing with its simplicity as this idea. Besides sanitary ware, Cecilie has worked out a series of bathroom furniture in style of Scandinavian minimalism, but with pretty slim and sophisticates lines. Exactly the opposite to Luv looks the other new product line named Vero Air. 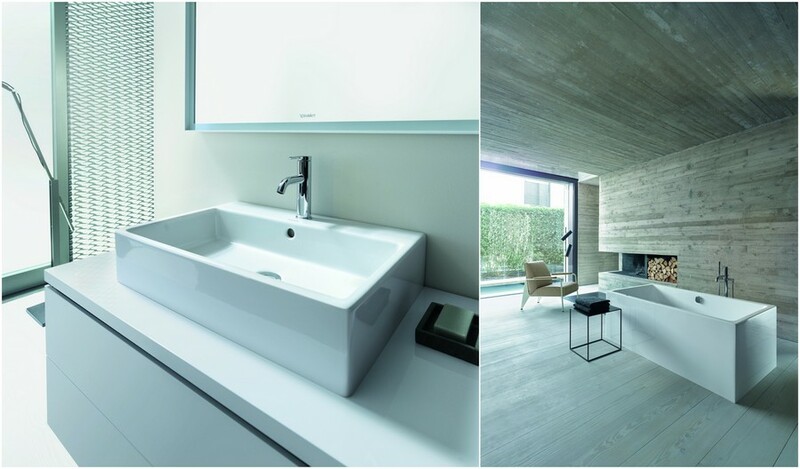 This is actually a re-interpretation of Duravit’s former collection Vero that first appeared back in 2001 and is still well distinguished from the rest of this company’s products thanks to its recognizable rectangular forms. Technologies develop and change rapidly, and now it’s possible to make wash basins, toilets, bidets and bathtubs even more geometrically precise, slim and with trendy narrow edges. 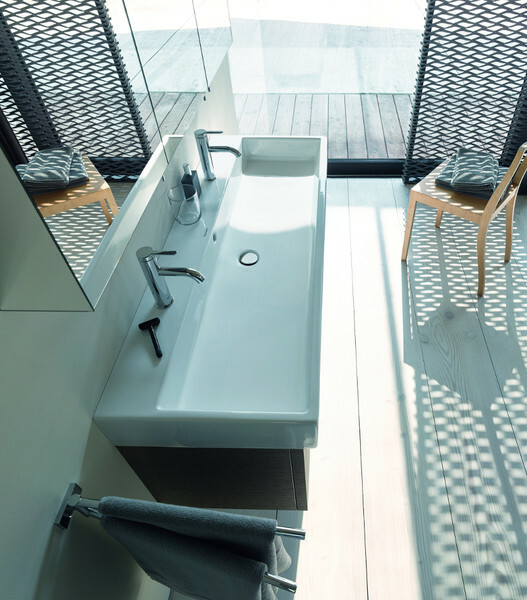 According to Duravit’s latest innovative approach, the Vero Air was designed with “c-bonded” concept in mind. 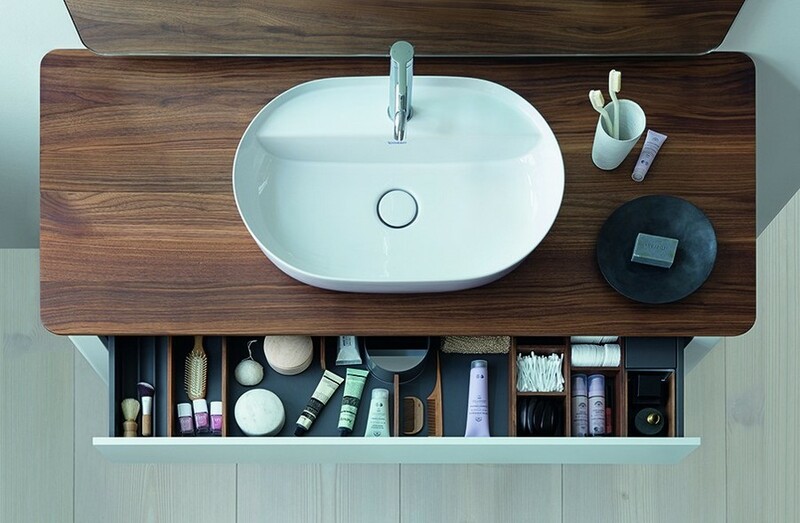 This innovative method was worked out by the Germans to make the connection between a washbasin and a vanity unit almost ideally precise, so that they formed an almost seamless whole. Becoming a single unit, the transition between the cold ceramic surface and warm furniture finishes becomes both aesthetically perfect and pleasant to touch. Toilets in the Vero Air collection are also rectangular and may boast having ideal geometry. But in this very product line Duravit for the first time managed to introduce their own registered innovative Rimless flushing technology into a rectangular-shaped toilet bowl. The combination of precise geometry, accurate design and advanced fluid mechanisms maximizes the efficiency of flushing and also keeps the rims easily accessible and hence easy to clean and more hygienic. Besides, Vero Air toilets have innovative antibacterial glaze that is baked directly into the ceramic surface during firing and kills 99.9% of bacteria and germs. The latter fact is officially confirmed by the tests conducted by the Institute for Hygiene and Public Health at the University of Bonn. But the key breakthrough of the year is a new toilet dubbed BioTracer that analyzes urine tests on its own! The concept of the smart toilet is the following: if you want to make a urinalysis, you start the BioTracer app on your smartphone or tablet before using the toilet. After that a small amount of your urine (about a few milliliters) is injected into a sealed dipstick test that is stored in a removable cartridge under the WC bowl. The test strip is then scanned a few types via an optical scanner and the data is sent to your device for the analysis. The app values 10 urine values, including the number of white cells, glucose level, protein count, pH and etc. Eventually you get a detailed analysis of your urine with the indication of values that deviate from the normal. The smart app can even give you a piece of advice on how to correct your diet or training schedule, depending on the results of the analysis. The data is transmitted via Bluetooth and is password-protected, so you shouldn’t worry about any leakage of your personal information. As for the next analysis, you shouldn’t take care about cleaning the system or changing the test strips: the BioTracer does it automatically and autonomously after each use. It uses distilled water to rinse the system and rotates the dipstick tests in the cartridge on its own. So far, the BioTracer is just an exhibition prototype, but we expect that Duravit will launch the full-fledged product on the market in no time!